Implants are like roots of teeth. They need to be surrounded by an adequate height and width of healthy viable bone. Dental disease and infection resorb this bone making it inadequate in volume or viability for dental implants. 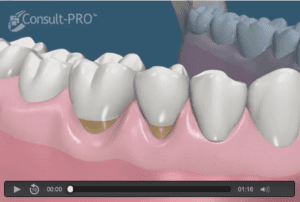 We use the socket preservation graft to try to minimize the bone shrinkage after a tooth is lost. Sometimes the bone defect is severe enough that the socket graft helps but we still do not have sufficient bone. Bone ridge augmentation can repair implant sites with inadequate bone structure due to previous extractions, gum disease, or injuries. Sometimes the tooth was lost years ago when socket preservation grafts were no used. Often we find that the longer a tooth has been missing, the more advanced is the bone shrinkage (we call it bone atrophy). Some patients never develop all of their natural teeth. In these cases we often find that the bone never developed a normal bone volume for a dental implant. Due to the causes of bone loss listed above, more significant bone grafting is needed to allow dental implants to heal normally and have a good long-term success. A bone graft always needs time to heal as it takes time for the human body to turn the initial bone graft into the patient’s own bone. The length of the healing time is based upon the severity and extent of the graft. Drs. Blecha and Jandali will determine the length of the healing time based upon your specific case. Sometimes the implant can be placed when the graft is placed and both the implant and bone graft will heal at the same time. Sometimes this approach is too risky; so we must perform the bone graft first and let it heal. After the graft has healed, the implant is then placed and then heals. This last approach takes a longer time for the patient to complete the treatment, but it is clearly the best approach for more severe defects. It is Drs. Blecha and Jandali‘s goal to minimize the use of complicated bone grafting and lengthy healing periods. In fact, Drs. Blecha and Jandali advocates graft-less solutions in implant treatment whenever possible. This is why we advocate early removal of problematic teeth before the bone loss becomes severe enough to require complicated grafting. This is why we suggest the socket preservation graft as well as early replacement of missing teeth before long-term bone shrinkage occurs. What Does The Bone Ridge Bone Graft Augmentation Do? A ridge bone graft augmentation graft builds up the bone externally. The bone that contains the teeth is called the alveolus. Teeth that are failing often have infection that destroys some of the bone around the teeth. An alveolar ridge augmentation (ridge augmentation) involves reconstructing this bone. The bone is built up horizontally or vertically as is needed for each case to make the bone suitable for a dental implant. These grafts usually work well. However, these grafts are delicate and can be ruined should the patient not care for them properly. In addition, special membranes may be utilized to protect and support the bone graft, as well as encourage bone regeneration. Platelet rich growth factors are usually used with the graft to stimulate graft healing. This is called guided bone regeneration, or guided tissue regeneration. Please see the section on Platelet rich growth factor/ Bone morphogenic protein section for further information on these products. The bone graft is placed beneath the gum tissue and is allowed to heal for typically 5 months. The patient must not apply chewing pressure or pressure from any temporary teeth to contact the area or it may ruin the graft result. The specifics of this vary with the particular case. Drs. Blecha and Jandali will review what you need to do in your specific treatment.